The baby diapers market across East Africa is largely consolidated with global companies such as Procter and Gamble, Unicham Corporation, and Kimberly Clark holding majority of the market, says Transparency Market Research (TMR) in a new report. Procter and Gamble held a share of 22% in Kenya alone in 2015, which is the key revenue contributor to the East Africa market for baby diapers. As most countries in the region fall in the developing category with major population in the low-moderate income economic groups, product cost is the key factor that determines growth of East Africa baby diapers market. Therefore, to maximize sales, companies are strategizing to bring down the final selling price of products. One of the key growth strategies adopted by key players is offering employment to their own distribution agents against following the normal course of selling through third party distribution channels. Product development using biodegradable materials that appeal to environmentally conscious parents and are soft on the skin and innovations in product design that address skin issues related to the use of diapers are also the focus of top companies in this market. Johnson and Johnson, Mega Soft Hygiene Products Co. Ltd., Indevco Group, Interconsumer Products Ltd., and SCA Hygiene are some other major companies in the East Africa baby diapers market. 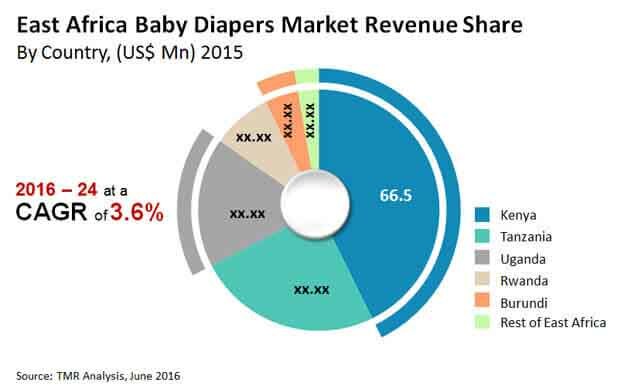 According to TMR, the baby diapers market in East Africa is expected to display a CAGR of 3.6% between 2016 and 2024 for the market to reach a valuation of US$218.7 mn by 2024 increasing from US$155.7 mn in 2015. Of the key product types, disposable diapers contributes the leading revenue to the East Africa baby diapers market. The segment accounted for a share of more than 80% in this market in 2015. Disposable diapers are estimated to stay dominant in the baby diapers market in East Africa throughout the forecast period. However, sales of disposable diapers is witnessing a decline due to concerns about the long-term health effects of synthetic diapers and concerns of skin rashes in the short term due to continuous use of these products. Thus, the demand for cotton diapers is on the rise that are free of synthetic materials and are considered safer than almost all disposable diapers. The increasing awareness about the use of eco-friendly products generally is leading to an increased use of cotton diapers. Kenya, which is the fastest growing economy in East Africa as estimated by the World Bank is presently the largest baby diapers market in East Africa. Large population base, stable economic growth over the past few years, drop in child mortality rates, and rising disposable incomes are the major factors driving sales of baby diapers in the country. Tanzania is the second-largest market for baby diapers in East Africa. Over the past couple of years, the increasing use of diapers for personal hygiene of infants and convenience are the primary factors driving sales of diapers among the urban population in East Africa. Active efforts undertaken by governmental as well as non-governmental organization to educate the rural population about the importance of personal hygiene of infants to prevent diseases is leading to the use of baby diapers across several countries in East Africa. However, the use of baby diapers has its own perils. The superior absorption of diapers leaves a tendency of delayed changing among parents, which can lead to rashes and skin problems on the delicate skin of infants. Some studies also suggest the prolong use of disposable baby diapers can lead to testicular cancer or infertility among males.